Heat the oil in a casserole dish. Season the shanks, then brown in the oil for 10 mins, or until dark golden all over. Once browned take the shanks out and put them to one side. Throw onions into the dish, soften onions for 10 mins on a medium heat until they get some colour then add garlic. Add the orange rind, juice, cinnamon sticks and red wine to the dish, and deglaze, cooking most of the liquid out from the wine. Sit the shanks back in the pan, then poke the quince quarters in and around the meat. Add in your stock, and bring to a simmer, then cover with a lid and put in the oven to braise for 2 hours. Once the meat is falling off the bone, remove from oven. Leave shanks to cool slightly in the liquid. To reduce sauce, remove shanks and quince from the liquid and then simmer the liquid down until it has the consistency of a glaze. If you would like the sauce to be sweeter and stickier, add a couple of tablespoons of honey while reducing. 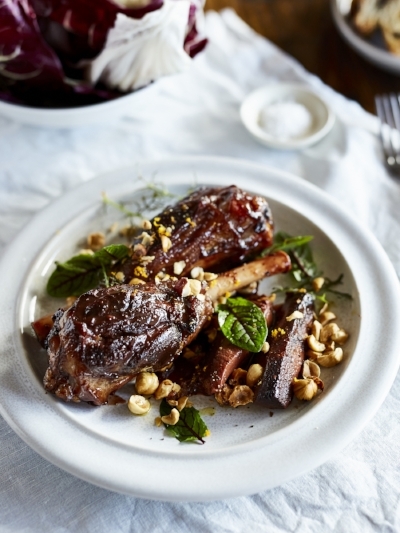 Serve sprinkled with roasted hazelnuts and fresh herbs. This recipe is by no means traditional but it is quick, hearty and comforting- all the things a winter one-pot wonder should be! 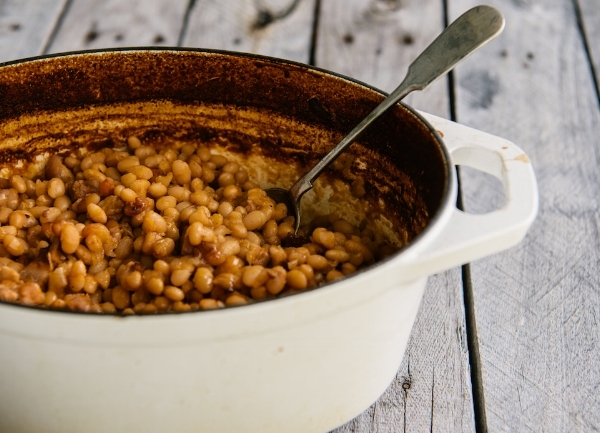 Heat the oil in a large cassoulet dish or heavy based pan. Add the chicken thighs laying them out so that they cook evenly. Once they start to reach a golden brown colour, turn over and continue to cook until both sides are golden brown and the chicken is cooked through. Take the chicken out of the pan and allow to rest. Using the same pan with the chicken juices, cook out the onion, garlic and butter with some salt slowly so they sweat and release all their sweetness and aroma. Once the onions are soft, add the thyme sprigs and bring back to a medium-high heat. Add the shiitake and shimeji mushrooms, cook out until the mushrooms are soft and golden brown. Add the white wine to deglaze the pan, bringing the pan liquid down by half (at this point add the truffle trim). When it has come down by half it should look thick and creamy. Next add the beans, water and bring back to the simmer. Whilst your pot is gently simmering, shred or slice your chicken into bite-sized pieces and add it back into the beans. Add the cavalo nero and stir through so that it cooks in the bean juices. By now the bean mix should be nicely reduced and thickening. I like to add a good amount of grated Parmigiano, which as you stir into the sauce, emulsifies and creates a really thick and creamy sauce base. Season with salt and pepper, maybe a splash of lemon juice if it needs some acid to balance the flavours. When serving drizzle a splash of good olive oil, a light dusting of Parmigiano and freshly slice truffles in front of your guests! To make coconut paste, combine all ingredients in a spice grinder (or mini food processor) and blend to a fine paste. Set aside. In a large saucepan heat 2 tbsp coconut oil over medium-high heat. Add pumpkin, onion, curry leaves, garlic, ½ tsp salt, turmeric, coconut paste and 1 cup of water. Leave to simmer, uncovered, until the pumpkin is soft and all the liquid has evaporated. Stir through remaining coconut oil before serving with steamed rice. Charu is a cook at Free to Feed a not-for-profit social enterprise that delivers a number of food-orientated initiatives through their HQ in Thornbury. Charu was a chef and restaurateur in her hometown Colombo, Sri Lanka’s coastal capital. Now living here in Melbourne with her young son, the two of them love making home videos of cooking together. She shares her expertise and passion for great food with such joy. In a large casserole dish or Dutch oven over medium-low heat, sauté onions in olive oil with a pinch of salt until soft. Add cinnamon sticks, garlic, cumin, coriander, cayenne pepper, cloves, bay leaves, and sauté until the spices are fragrant. Add the pork shoulder to the pot and allow it to brown in the spices, turning regularly for a few minutes to ensure all sides of the meat are coated in the spice mix. Add the chicken stock and brown sugar and stir to combine, season with salt and pepper, put the lid on, drop the heat to low and cook for about three hours or until the meat can be pulled apart with two forks. You can also pop it in the oven at 140 C°. 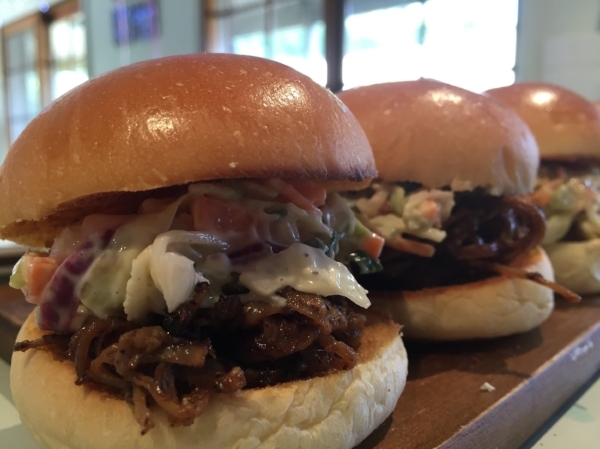 Once you have pulled the pork apart you can adjust the consistency of the sauce. If it has too much liquid, then reduce the sauce over low heat until it thickens a little. This pork freezes brilliantly so any leftovers can be stored in an airtight container in the freezer. When my family smells a pot of this they always have sliders on their mind, we add it to a bun with a healthy serve of coleslaw. Raquel is the assistant editor of Vanilla Magazine. She writes about beauty, lifestyle, food and horticulture. In a large, ovenproof pot, add beans and water. Bring to a boil. Reduce heat and simmer for 15 minutes. Add pork, onion, maple syrup, ketchup, vinegar, mustard, salt and pepper. Stir to combine. Cover and transfer to oven. Cook 2 hours, stirring every 30 minutes. Remove lid and cook another 45 minutes. Serve immediately or at room temperature. Place the saffron in a mug and half-fill with boiling water (about 150ml) allow to stand. Meanwhile, heat a large non-stick frypan fitted with a lid over medium-high heat. Add oil and cook chicken thighs until caramelised. Reduce the heat to medium, add the onions and chorizo to the pan and cook for about 7 minutes until the onion is soft and the chorizo has begun to crisp. Add the capsicum and garlic and cook, for 1-2 minutes before adding the butter and rice; stir to coat. Pour in the saffron and chicken stock, salt and freshly ground pepper and stir. Sprinkle the corn over the top of the rice and cover with a tight-fitting lid, reduce the heat to a low simmer and cook for 12 minutes or until the rice is tender. Remove from heat and leave the pilaf to stand, covered, for 10 minutes to allow any excess steam to be absorbed - this makes for a fluffier pilaf. Stir the pilaf with a fork to combine and serve scattered with fresh parsley, toasted flaked almonds and a dollop of Greek yoghurt.